Alice Robertson, the next woman to follow Jeannette Rankin into Congress, was her predecessor's polar opposite. Colorful, quotable, conservative, and hostile to the women's suffrage movement and its many leaders, Robertson's single term in the House hinged on her rejection of a significant piece of legislation—a proposed World War I Veterans Bonus Bill. In the 67th Congress (1921–1923), Robertson was rewarded for her lifelong work on Native–American welfare with a seat on the Committee on Indian Affairs. She also received assignments on the Committee on Expenditures in the Interior Department and, as the only woman in Congress, on the Committee on Woman Suffrage. Congresswoman Robertson's other legislative work accorded with her district. She secured authorization for the construction of a veterans' hospital in Muskogee to assist the more than 91,000 Oklahomans who served in World War I.11 Robertson also won approval for an amendment that increased the subsistence rate and rent money for army and navy nurses. She supported higher tariff rates and stricter immigration quotas—positions which Oklahomans broadly approved. Like many midwestern politicians, Robertson also opposed the entry of the United States into the League of Nations. She challenged Representative Meyer London of New York when he urged the release of labor leader Eugene V. Debs from prison. 1Alice Robertson's maternal father, Samuel A. Worcester, argued before the U.S. Supreme Court on behalf of the political autonomy of the Cherokee Nation in the 1832 legal case Worcester v. Georgia; "Woman Congress Member Likes D.C.," November 1920, Washington Post: 1. 2Hope Chamberlin, Minority of Members: Women in the U.S. (New York: Praeger, 1973): 39; for the section on her relationship with Theodore Roosevelt, see also Nancy Shoemaker, "Robertson, Alice Mary," American National Biography 18 (New York: Oxford, 1999): 621–622. 3Hope Chamberlin, A Minority of Members: 39; "Miss Robertson of Oklahoma," 13 November 1920, New York Times: 10. 4Robertson introduced two bills and two committee reports appropriating funds and granting relief to Native American Tribes (HR 8273, HR 10495, H. Rep. 11140, H. Rep. 1452), none of which were ever considered (see the Congressional Record, House, 67th Congress). 5 Congressional Record, House, 67th Cong., 4th sess. (3 March 1923): 5679. 6Cited in Susan Tolchin, Women in Congress (Washington, D.C.: Government Printing Office, 1976); and in Chamberlin's A Minority of Members: 39; "Against League of Women," 10 February 1921, Washington Post: 6; "Robertson Says Women Must Take Election Risk,"16 March 1922, Washington Post: 5; Mayme Ober Peak, "‘Miss Alice' Is Content After One Term to Retire to Her Sawokla Farm in Oklahoma," 4 March 1923, Washington Post: 75. Robertson's remark about the Packard car was not aimed at any particular woman suffrage leader, Rankin included. 7Chamberlin, A Minority of Members: 41; Constance Drexel, "Miss Alice Fights ‘Better–Baby' Bill," 24 July 1921, Washington Post: 6. 8Peak, "‘Miss Alice' Is Content After One Term to Retire to Her Sawokla Farm in Oklahoma" "Woman Presides at House Session; First in History," 21 June 1921, Washington Post: 1; "Woman Presides in Congress; Precedent Broken Amid Cheers," 21 June 1921, New York Times: Shoemaker, "Robertson, Mary Alice," ANB. 9Stephen W. Stathis, Landmark Legislation: 1774–2002 (Washington, D.C.: Congressional Quarterly Press, 2003): 185. 10Chamberlin, A Minority of Members: 42; Tolchin, Women in Congress: 71. 11Chamberlin, A Minority of Members: 41; Arrell Morgan Gibson, The History of Oklahoma (University of Oklahoma Press: 1972): 140. 12"Can't Get Any ‘Pie,' But Won't Give Up," 5 December 1921, New York Times: 1; "Miss Robertson Opens Reelection Campaign," 5 July 1922, Washington Post: 10. 13"Muskogee County, Oklahoma: Turning Back the Clock," (Muskogee, OK: Muskogee Publishing Co., 1985) http://www.rootsweb.com/~okmuskog/peopleplaces/turnback11.html (accessed 1 August 2003). Papers: In the Elizabeth Lowell Putnam Papers, 1887-1935, 15.5 linear feet. 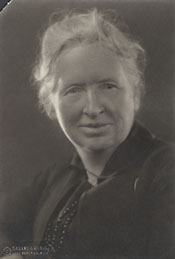 Subjects include Alice M. Robertson. Papers: In the Althea Bass Papers, 1847-1955, 0.3 feet. Subjects covered include Alice M. Robertson. An inventory is available in the repository. Papers: In the Walter S. Ferguson Papers, 1870-1920, 735 items. Subjects covered include Alice M. Robertson. An inventory is available in the repository. Papers: In the Charles N. Haskell Papers, 1903-1907, 33 items. Subjects covered include Alice M. Robertson. Papers: In the Patrick J. Hurley Papers, 1900-1956, 188 feet. Subjects covered include Alice M. Robertson. An inventory is available in the repository. Papers: In the Edith Cherry Johnson Papers, 1910-1951, 18 items. Subjects covered include Alice M. Robertson. An inventory is available in the repository. Papers: In the J.B.A. Robertson Papers, 1903-1938, 4 feet. Subjects covered include Alice M. Robertson. An inventory is available in the repository. Papers: In the Works Project Administration Historic Sites and Federal Writers' Project Collection Records, 1937-1941, 23 feet. Subjects covered include Alice M. Robertson. An inventory is available in the repository. Papers: 1820-1931, approximately 25 feet. Personal and business papers, correspondence, photographs, a large collection of newspaper clippings, memorabilia, and writings. A finding aid is available in the repository and online. "Alice Mary Robertson" in Women in Congress, 1917-2006. Prepared under the direction of the Committee on House Administration by the Office of History & Preservation, U.S. House of Representatives. Washington: Government Printing Office, 2006. James, Louise B. "Alice Mary Robertson--Anti-Feminist Congresswoman." Chronicles of Oklahoma 55 (Winter 1977-1978): 454-62. Morris, Cheryl. "Alice M. Robertson: Friend or Foe of the American Soldier." Journal of the West 12 (April 1973): 307-16. Reese, Linda Williams. "Race, Class, and Culture: Oklahoma Women, 1890-1920." Ph.D. diss., The University of Oklahoma, 1991. Spaulding, Joe Powell. "The Life of Alice Mary Robertson." Ph.D. diss., University of Oklahoma, 1959. Stanley, Ruth M. "Alice M. Robertson, Oklahoma's First Congresswoman." Chronicles of Oklahoma 45 (Autumn 1967): 259-89.